We heard your wishes for an inexpensive but highly robust machine and have delivered: The Mudd-Ox Vengeance. Our latest model was engineered to utilize a skid-steer T20 transmission in the extremely capable Mudd-Ox chassis. One unique aspect to the T20 model is the ability to split-shift the transmission. If you’re in a tight spot and wish to have counter-rotation, the operator can individually shift each side of the transmission to drive both set of wheels in opposite direction. Enjoy the heavy duty 1.50’’ inch solid axles with durable chain tensioners. It is the best of both worlds. 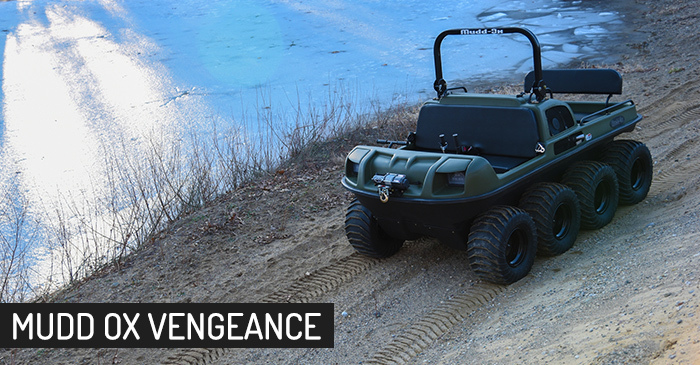 Along with the other Mudd-Ox’s in our lineup, the Vengeance can haul up to 6 passengers and a has towing capacity of 1,800 lbs. Conquer the terrain with an industry leading 13’’ center ground clearance piloted with our own 26’’ tall Vendetta tires in 12, 14, or 16’’ wide. Select your power plant between a 23, 30, or 38 hp EFI engine. Enjoy the wide range of accessories from tracks to heated cabs. The possibilities are endless. Drive through rugged terrain, then swim across the water. This is a machine created by the people for the people. 25″ x 12″ x 9″ Std. [A]Top speed depends on terrain conditions and drive train options. [C]See Owner’s manual for accessory listing and weight. [D]Capacity includes occupants, cargo, and installed accessories. [E]See Owner’s Manual for full warranty information. [H] Approximate Towing Capacity, depends on surface type and vehicle load as well as incline. Max Hitch Tongue Load is 150 lbs.